Globus New Media LLC, dba Gobosource is a privately owned business operating from Scotts Valley, California. We have pioneered glass gobo manufacturing with state of the art laser equipment. 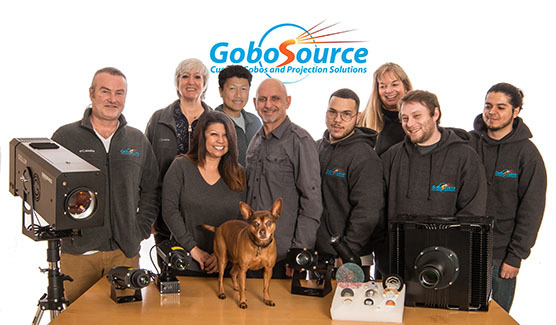 We are Glass Gobo Specialists and offer turnkey solutions, consisting of all the equipment needed for gobo projection, such as selected projectors and accessories. We have an exclusive glass gobo factory and produce Glass Gobos at our location in Scotts Valley as well as in Italy. We also offer the full line of Rosco Gobo Products. Many Rush Orders can be produced and shipped the same day. Our streamlined, state of the art production facilities allow us to offer you volume production of sophisticated glass gobos at unbeatable prices. For example, we manufacture OEM gobos for Martin Professional and Clay Paky high end moving heads. For achieving the best possible projection quality, we utilize a production facility, with the highest resolution lasers in the industry. Our laser technology ensures exact reproducibility of every single gobo, from the first of a series to copies, produced two years later.